Today I received the best news I could ever hear: I am cancer free!. Today my tears are tears of joy; I have a second chance in life. All your support and prayers have kept me strong and positive during this journey and I am grateful. 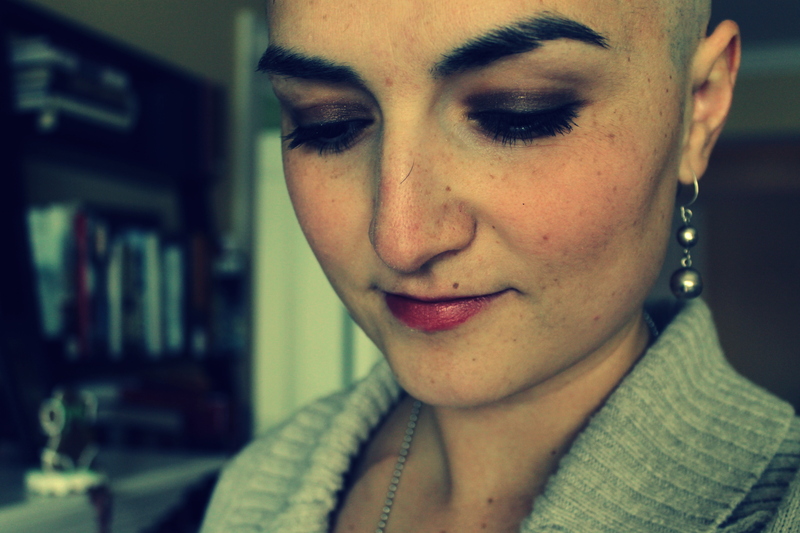 2013, a year that starts with a new look (I am bald now) and a new treatment. Although we were very busy during the holidays, we had a great time. My parents and younger sister spent Christmas with us. We had a Mexican/American holiday dinner on December 24 that was delicious. It was great having them at home since I went through the first cycle of intense chemoteraphy during the holidays, their moral support was very important. In a previous post, I talked about the hard decision we had to make regarding treatment. Indeed I believe in research and after doing my homework, looking for information on “Grey Zone Lymphoma”, reading blogs from patients and survivors, and having conversations with friends and family; We decided to go with the treatment proposed by the Lymphoma Team at NIH. The National Institutes of Health (NIH) is the US medical research agency. It is a federal government entity whose work and research benefit not only the people in the US but the world. The new treatment proposed by the group of experienced doctors and nurses at NIH consists on two cycles of intense chemoteraphy followed by 6 weeks of radiation. Each chemo cycle lasts 5 days. The first day I had to stay in the hospital for 24 hours. The next 4 days are not so bad since I carry a fanny pack (“cangurera” in Spanish) with a pump that administers the chemo. I can go home and do my regular activities. Each day I go back to the hospital to change the chemo bag and then I go back home. The new chemoteraphy regime includes the following medicines: Campath, EPOCH and Rituximab (DA-EPOCH-R). These medicines are extremely powerful and believe me, they work. When I asked about loosing my hair, I remember the doctor telling me that I will will lose my hair on the the third week after the first cycle. Since I didn’t lose all my hair on the first round, I thought the doctor was underestimating my “Mexican genes” (like Dave says)…. well my hair is gone and I have a new look. Now I can change my look each day and I am having fun with it. It is definitely a process of finding what makes me feel comfortable and great. I can wear a wig, a scarf, a hat, or whatever I want. I can also try different colors, lenghts and styles. Certainly, on the next post, I will share some of the funny stories. Tomorrow I start cycle 2 of my treatment and I will spend the night at the hospital so the chemo does it magic and gets rid of the cuckoo cells. This is certainly a new start and I am looking forward to winning this battle and regaining my g ood health. Your prayers, positive thoughts, calls, cards, and emails mean a lot to me. But most importantly, I am grateful for feeling so loved and supported by our families and dear friends. Thank you!